Majority of webpages have long vertical content and hence make browser display scroll bar on the right side. Default scroll bar in Google Chrome browser can be customized for more screen space resulting in comfortable web browsing. You can remove scroll bar on the right side for more webpage viewable area. Alternatively, you can get modified version of scroll bar which is thinner in size for more screen space. 1. Launch Chrome browser and open No Scroll Bars Please Chrome extension webpage. 2. 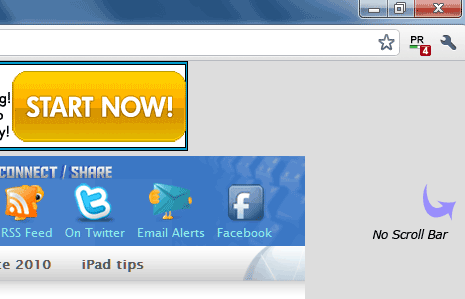 Click Install button for downloading and installing this extension. 3. After successful install, you will notice scroll bar on right is no longer visible and is removed. While scroll bar is removed, you can still scroll webpages using middle mouse buttons and keyboard arrow keys. To get back scroll bar, just remove or uninstall this extension. 1. 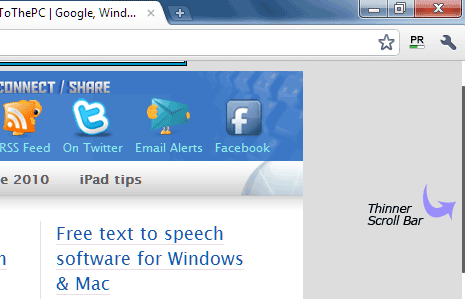 Open Thin Scroll Bar Chrome extension webpage in Chrome browser. 2. Click Install button and follow on-screen steps to complete installation. 3. Now you should see thinner scroll bar on the right side resulting in more screen space. You can get back default scroll bar by removing this Chrome extension. Thinner scroll bar looks good, just for a change – what say?